Feb. 16, 2011 6:00 p.m.
On Thursday, February 10, 2011, the RCMP witnessed the passing of the Alberta command from Senior Deputy Commissioner R.R. Knecht to Assistant Commissioner D.N. McGowan. Senior Deputy Knecht assumed his new responsibilities in Ottawa when Senior Deputy Commissioner Bill Sweeney retired on July 1, 2010. Assistant Commissioner Dale McGowan comes to "K" Division from "F" Division, Saskatchewan. He was born and raised in Edmonton, joining the Royal Canadian Mounted Police in 1978 after receiving his police training at the RCMP Training Academy in Regina. Over his 32 years with the RCMP, he has served in Alberta, British Columbia, Saskatchewan and the three northern territories. 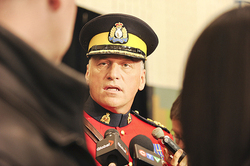 Assistant Commissioner Dale McGowan stated, "Thirty-two years ago, I left Alberta to become a Mountie. I can think of no greater honour than to return to my home province as Commanding Officer – to be entrusted to lead the men and women of “K” Division." Guests who were in attendance included the Honouralbe Donald S. Ethell, L.G. of Alberta and Her Honour, Linda Ethell, Premier Ed Stelmach, Minister Frank Oberle, Solicitor General Public Sercurity and Commissioner William Elliott, Commissioner of the RCMP.